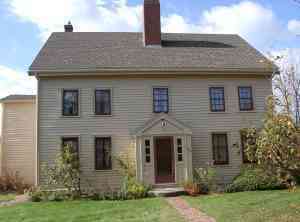 Of particular interest to the descendents of John and William Rayment are the old Rayment and Raymond houses in Beverly, Massachusetts. 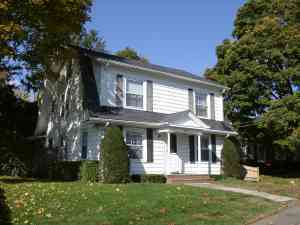 The house at #128 New Balch Street is shown to be the John Rayment mansion house. 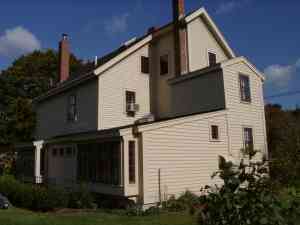 The house at #120 belonged to the Raymond family from early times, generation after generation until 1969. Its origins can be traced back to 1764 and perhaps back to 1690. Alice Gertrude Lapham in The Old Planters of Beverly gives the approximate location of some of the earliest houses in North Beverly. Near the upper end of Balch Street, on the west side near a bend in the road is the John Rayment House (#6 on the map). The Old Planters of Beverly, frontpiece. Genealogy of the Balch Families in America, vol. 1, p. 17. 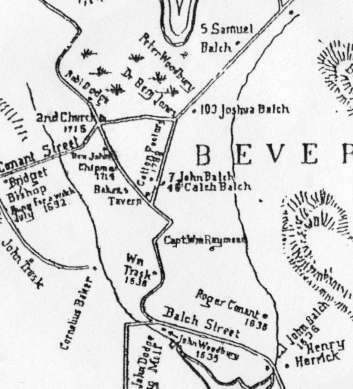 Also of note, Captain William Rayment is shown dwelling on the east side of Balch, opposite where Lapham places the John Rayment mansion house. This seems to be the location of William's house. But that is a topic for another article. HCEI, vol. LV, p. 208. And if #128 is the Sands house, then it is the original John Rayment mansion house. Through historical records we traced the descent of the John Rayment mansion to the Sands house of 1872. 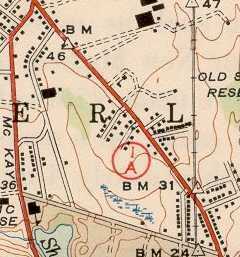 Using USGS maps we traced the house from 1872 to 1949. 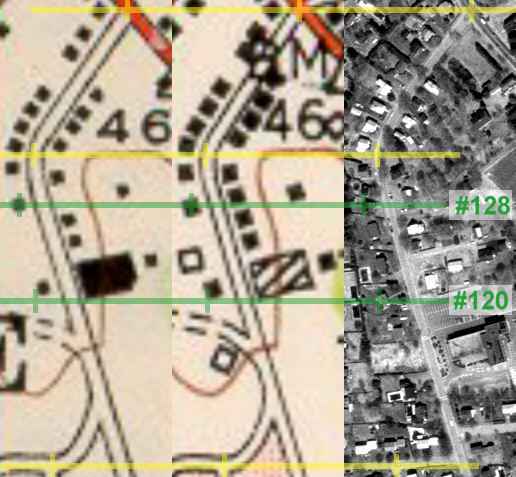 Comparing USGS maps to a modern, high-altitude photograph of the neighborhood, we traced the 1949 house to the present #128. Inspection of the basement of #128 gave supporting evidence that if only two houses have existed continuously along the western side of that stretch of Balch since before 1872, #128 is one of them. Through historical records we traced a portion of John Rayment's lot, and afterwards a house that set on it from colonial times down to the present house at #120. Maps from 1872, 1944, 1949 and a modern high-altitude photograph collaborate the historical record. Investigate why Samuel W. Balch indicated William Trask lived on what became the John Rayment lot. 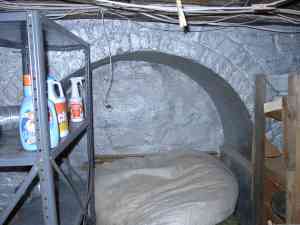 Investigate if Trask's house has a connection to the origin of #120. Investigate further the origin of #120. Where did the dates for building the house mentioned in the MHC Form B for #120 come from? Check the cited references. Check Maps and Atlases of 1852, 1880, 1884, 1897, 1907, 1919. 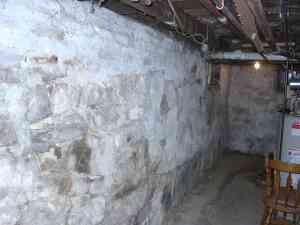 These are mentioned on the MHC Form B for 64 Dodge Street. For the deeds that are available online, add links to them. Try to find more information about the pulpit tradition. I seem to recall reading a detailed account somewhere. Assemble evidence and write an article about the location of William Rayment's house. Write an article about 64 Dodge Street. 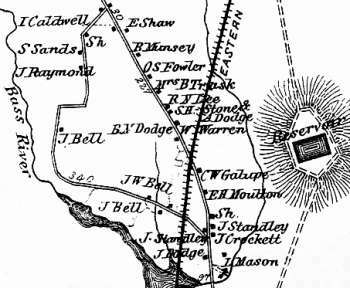 Atlas of Essex County, Worley & Bracher (Engravers), D.G. Beers & Co. (Publisher), Philadelphia, 1872. Reprints available from Higginson Book Company. Genealogy of the Balch Families in America, Galusha Burchard Balch, 1897. 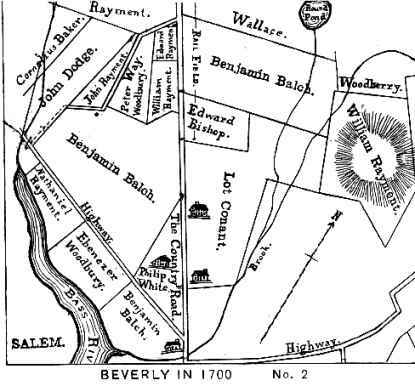 Historical Collections of the Essex Institute, "Salem in 1700," Sidney Perley, 1919, vol. LV, pp. 208, 219-220. History of Salem, Massachusetts, Sidney Perley, 1926, vol. II, p. 417. Massachusetts Historical Commission Inventory Form B - Building, #120 New Balch Street (1973) and #48 New Balch Street (1977). Copies in the possession of the Beverly Historical Society. The Old Planters of Beverly in Massachusetts and The Thousand Acre Grant of 1635, Alice Gertrude Lapham, 1930, pp. 79-80,83-84. 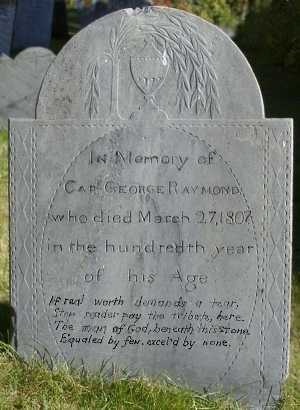 Genealogies of the Raymond Families of New England, Samuel Raymond, 1886. 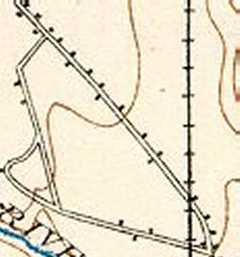 USGS Salem Quadrangle Map, 1893. 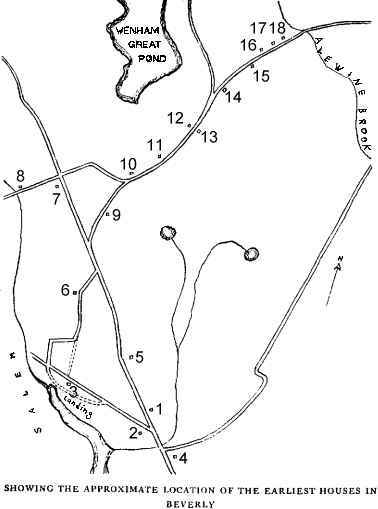 Surveyed 1886. Reprinted 1940. http://docs.unh.edu/nhtopos/Salem.htm . Upper Balch is in the SE Corner. 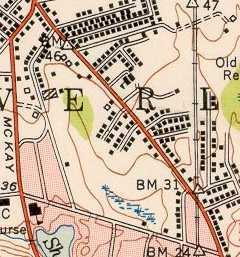 USGS 7.5 minute series, Salem Quadrangle Map, 1944. Surveyed 1942. Revised 1949. http://docs.unh.edu/nhtopos/Salem7.5MA.htm . Upper Balch is in the NE Corner. Personal interview by the author, October 2000. North Beverly Remembered, Richard W. Symmes, 1987, p. 28. MIT/MassGIS Orthophoto , http://ortho.mit.edu, (249827,924416), 1995. Photographs were taken by the author 19 October 2000.